Manuscripts containing Greek medical texts were inventoried by author and work at the beginning of the 20th century by a group of philologists under the direction of Hermann Diels. Useful as it was - and will continue to be – Diels’ catalogue omitted authors and works, misidentified manuscripts, and overlooked codices. Furthermore, since the publication of the catalogue, some libraries have adopted a new system of classification, manuscripts have been destroyed, items have changed location, and new ones have come to light. The present Census is a checklist of the Greek medical manuscripts currently known in collections worldwide. It is both an amended and updated index of Diels’ catalogue, and a list of the items missed or overlooked in Diels, or located since. Although it does not supersede Diels’ catalogue, it is the indispensable instrument for a New Diels, and will be the reference for years to come for any new critical edition and medico-historical research based on manuscripts, besides providing the basis for a broad range of other historical inquiries, from codicology to the history of medicine and science, including Byzantine intellectual history, Renaissance studies and humanism, history of the book and early printing, and the history of medical philology and learning. Contents: Foreword; Introduction; Greek medicine. 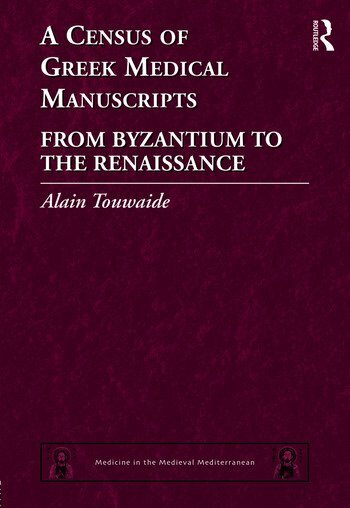 A census of Byzantine and Renaissance manuscripts; Bibliography; Index. Alain Touwaide, PhD, is the Scientific Director of the Institute for the Preservation of Medical Traditions. "Having followed for several decades - though episodically - Alain Touwaide’s painstaking and time-consuming investigation, I can witness to the perseverance with which he performed and completed his endeavor. Now having carefully and patiently read his impressive volume, I can attest to the extreme accuracy, as well as to the sheer magnitude, of his accomplishment. His work is the result of long and difficult research in the catalogues of manuscript collections and scholarly literature, completed by personal in-situ inspection of many codices. With the present volume, all the data resulting from this quest are made available to the scholarly community." "The census is an inventory of all known surviving Byzantine medical manuscripts — it lists their titles and locations — and is primarily a tool for other researchers to spread knowledge of horticulture, botany, medicine and literature in the Middle Ages. It took 30 years of concerted effort, Touwaide said, and increases the number of known manuscripts from approximately 1,500 to 2,300, tracked to some 150 locations. (...) This is more than just an exercise in logging historical documents. No two manuscripts of the same text turned out quite the same, and the fascination is in how they differ." "Touwaide and Appetiti visited collections as famous and varied as the Pierpont Morgan Library in New York, the Vatican Library, the British Library, and the Bibliothèque Nationale de France as well as small, privately owned collections scattered across the globe in order to catalogue and identify each manuscript. Additions to Diels’ catalogue list the title, the author if known, to which collection the manuscript belongs, and a brief overview of its contents. This information provides immense value to researchers, who can look up a manuscript and know beforehand if it contains subjects relevant to their study." "The work of decades for Touwaide and Appetiti serves as an invaluable resource for classical scholars around the world, in the traditions of Diels and his original catalog. As medical science draws increasingly on natural products research for new sources of drugs, perhaps the knowledge recorded by ancient Greek physicians holds the key to the next big discovery." "... profound, very meticulously prepared, and convincing ... the book is the result of impressive studies conducted by its author over decades. It offers a considerable amount of important information ... a most useful publication indeed."